The enigmatic Grand Admiral Trawn is a legend in the Imperial Fleet. Where conventional methods have failed, Thrawn's strategic genius prevails. At the head of the Seventh Fleet, at the controls of the flagship Chimaera, Thrawn studies his enemies with meticulousness in order to exploit each of their weaknesses. Thrawn uses each resource to his advantage, adopts new technologies and forces unexpected allies to serve him to override the Rebel Alliance and destroy his leaders. This expansion contains everything you need to add 1 Chimaera flagship and 2 Mandalorian Gauntlet Squadrons to your games. Be careful this game is an extension of Star Wars: Armada and cannot be played alone. 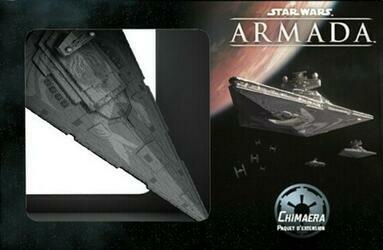 To be able to play it you must have a copy of the game Star Wars: Armada .